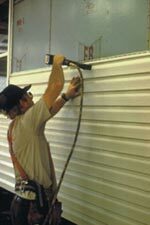 Make no mistake about it, the manufactured housing industry is also a people business. A lot has been written about the advantages of having a home built in a factory with all the protection of a factory roof and the modern technology that is housed in the plant … and it’s all true. The industry also has a professional army of men and women who run the plants and use the modern technology to build the homes. Roger Lewis works at an Indiana manufactured housing plant and has spent the last 19 of his 53 years in the industry. Lewis takes an enormous amount of pride in his work. If you ask him what he does, he’ll hand you a personal card that says, “Roger D. Lewis, Design Engineer & Cabinet Maker.” Visit him at work and you’ll find him surrounded by machinery, cabinets and fellow workers. Watch him and you’ll see a man who moves quickly, is very efficient with his time and is obsessive about quality. They call his area of the plant the cabinet shop. Watching the process of a manufactured home being built is a unique experience. Lewis and his colleagues waste no time. As the homes move slowly between the various construction areas, workers move with great swiftness. There are no hammers and nails, but there are automatic nail guns popping rhythmically; you’ll also hear the high-pitched sound of automatic wrenches. Overhead, large cranes gently lower walls and roofs to their exact location. Electrical craftsmen systematically guide carefully prepared bundles of wires along walls and floors; window installers place name-brand windows in their specific openings. Each person working on the line has a special skill. Then, there’s the ever-present inspection team, double checking each operation. Cleanliness is obvious as you walk through the plant. The people maintaining the are constantly at work … nothing accumulates, refuse is always being removed. Computer screens are found throughout the plant. The highly trained people who operate them provide modern designs and floor plans, efficient use of materials, right-on-time scheduling and communication with suppliers and retailers. Teamwork is apparent. If one person along the line fails to do his/her job properly, it affects all of the workers. Each worker knows that what he or she does has an effect on everyone else. Roger Lewis is a professional and an excellent example of the many men and women who make up the manufactured housing industry. It is a people business.